David Huynh has recently joined the freebase team, after having worked on Exhibit and other SIMILE tools at MIT. His new project Parallax is obviously based on Exhibit (which followed mostly a faceted filtering paradigm) but demonstrates a really interesting “sidewards browsing technique” for navigating related sets of different types of entities. As an example, you could start with a set of architects, then filter down to all modern architects, plot them on a map, a timeline etc. – quite nice already, but traditional facet browsing in principle. The catch however, is that you can explore related collections, like the buildings they designed, their birth places etc. in the same manner. Very interesting principle and nicely executed, yet a bit hard to explain. Freebase Parallax: A new way to browse and explore data from David Huynh on Vimeo. As a side remark: academically, I think the Humboldt paper by Georgi Kobilarov first presented this principle (but they also refer to an earlier prototype of David’s work). Unfortunately it was introduced under the name of pivot browsing, which is sort of reserved already for the quite related, but not identical principle introduced in dogear. Any ideas for a good name? Sidewards browsing? Entity shift? Or just stick with parallax? My name is Moritz Stefaner. I am interested in information aesthetics, interactive visualization, and how the web transforms our understanding of information. I hold a B.Sc. in Cognitive Science and an M.A. in Interface Design. 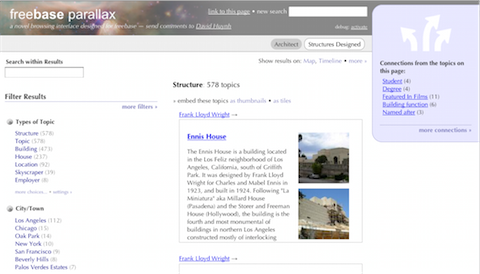 A custom Wordpress template, originally based on the Green Marinée template by Ian Main. Uses the fantastic Blueprint CSS framework for tip-top web typo!